Top Notch Material: Firefly Toothbrushes Makes it Fun to Brush Teeth! Firefly Toothbrushes Makes it Fun to Brush Teeth! It is important to teach children at a young age, the importance of proper oral health. I know that can sometimes be tricky with kids, because I struggle with my six year old. I have found that the more fun we make teeth brushing, the easier it is to get him to participate. 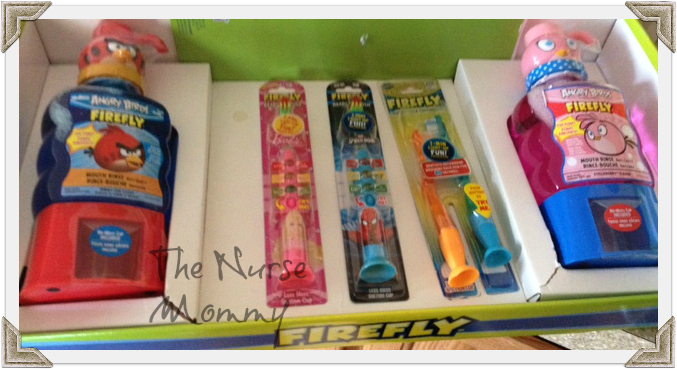 Firefly recently reached out to me to do a review of the all new Angry Birds Pump Mouthwash and an assortment of toothbrushes! My little man loves the fun pump and does not mind the flavor of the mouthwash at all. I had to try it myself, and it is a very sweet taste that any child would like. The flavors are bubblegum or berry and the mouthwash is sugar and alcohol free. Firefly also offers light up toothbrushes, battery powered and manual toothbrushes. The best part is the super cool characters that they have on their brushes such as: Care bears, Batman, Angry Bird, Peanuts, Strawberry Shortcake and many more! As you can tell, the products offered by Firefly make it really enjoyable for kids to brush their teeth. Making it more fun means less fights with them about the chore! Clean teeth are happy teeth!